Who doesn’t love the Edmonton Oilers? Living in Hockey Country you almost have to be a fan of some hockey team. While we are not really big on hockey in our house, we still love and support our local teams. And a good Hockey Game always gets us excited. 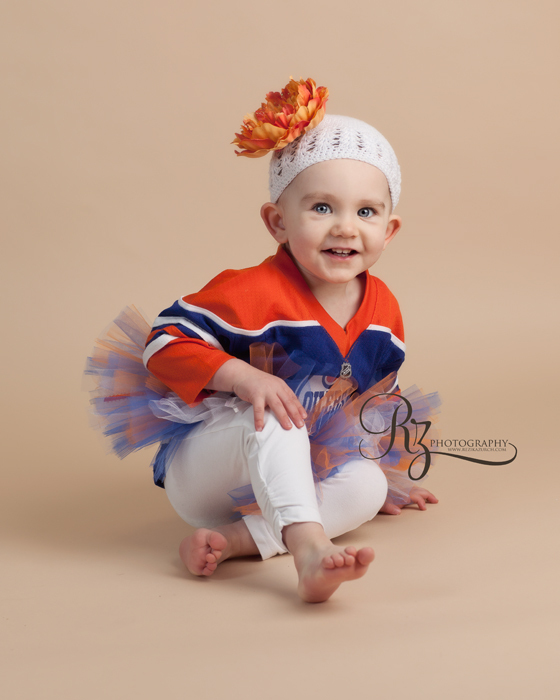 I photographed a dear friends little sweet heart all dressed up in Oilers gear. These images were a Christmas Present for her Daddy so I couldn’t share till now. I was so pleased with them! She was so cooperative and has the sweetest eyes. Dana Monticelli - What a little cutie! Adorable! Katie W - I bet daddy loved these, how cute! 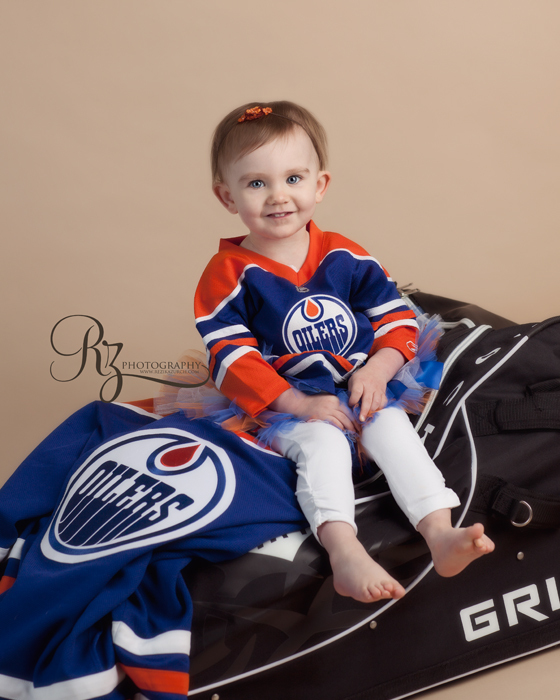 Amara Cohen - Even though my house is Boston Bruins all the way, she makes an Oilers shirt look good! Kerri - So cute! I’m sure her daddy was thrilled. Becky - Aw! These are adorable! JodyG - Awww! She is just tooooo cute! tiera - What a cutie! Great job! jennifer - How cute is she?! Lovely photos!!! Jessica - Oh, these are too sweet. I bet he just loved this gift! Beth - This will be a great image for her dad’s office! Lorie Hall - I LOVE IT! These are precious photos! She is an absolute doll! Breanna Peterson Photography - she’s adorable! steph - ADORABLE!!! Ohmygoodness, so cute!! Judie - Oh my, she is too cute! Michelle B - Love the little cutie. I also love the hockey reference. It doesn’t all have to be girlie stuff. Michelle - What a cutie! Francine MIttenthal - She’s adorable!!! Great shots! 2011 was a wonderful year for the business and I had the pleasure of meeting and photographing so many new families. I love seeing returning clients with new babies as well as all the new faces. I had the pleasure of working with two most amazing parents and the best thing is one of my daughters teachers at woodvale playschool in Edmonton. This little guy was a pro and I am so excited to share a few images from our session. I decided in 2012 I would make my blog a little more personal and share with you the things that motivate and inspire me. So today I am going to share with you my youngest daughter Izabella. They had a Christmas concert at woodvale playschool and after they got to decorate ginger bread houses and she did hers all on her own. Suzanne - What a special memory for your daughter’s teacher to have you capture his first days. He looks so little and cuddly, and so very peaceful all curled up. Beautiful work! sally - beautiful, soothing colors..I love the simplicity of the newborn pictures and the soft colors of the pictures with your beautiful daughter. jennifer - How sweet is that snuggly baby!? And I love that you are incorporating more personal photos into your blog! Kathy - What a little cutie! Those pics are dreamy! Your little girl is super cute too! Kerri - The baby is adorable, and so is your daughter :). Love her ginger bread house! She did a great job! 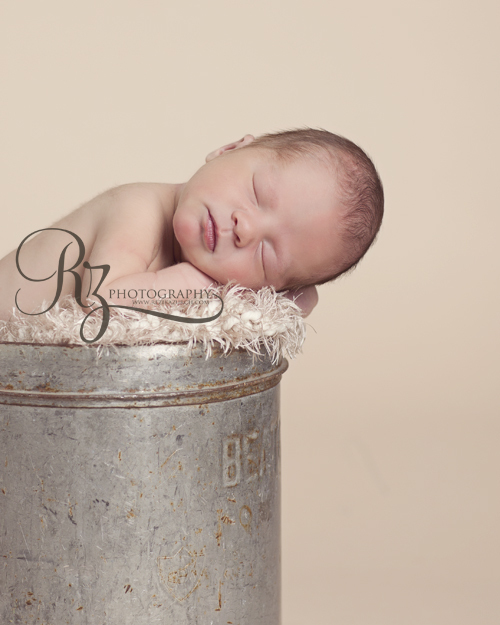 amy - aww– love the newborn shots! and your daughter is just beautiful! Kim - I love how you added something personal to your post! Sandy - These are so adorable, lovely work! Katie W - SO wish I had photo of mine as newborns, beautiful images! Becky - Love these! So Sweet! Angie Seaman - Great shots girl. Love them. That metal bucket is fantastic. Great prop. Keep up the awesome work! Jo BluElla - Lovely! Oh that stool the baby is on is so gorgeous as well. Nicki - So cute! love the footstool shot! michelle dixon - that is one tastey lookin gingerbread house!!! yum! so beautiful! Michelle - These are adorable! I love the footstool shot best! Laura A - So so beautiful!! reena - The baby is just beautiful as is your daughter! Andrea - Awwww- these are great! I have that same white stool- I smiled when I saw it- great photos!! We had so much Fun in Provost this weekend at their Kinsmen Splash and smash. Me and the girls got to go to this really awesome location to take some pictures and thanks to our friend Kevin I was able to get some really great shots, especially of Izabella who hates my camera. Deanna - What a gorgeous location! Please tell me you will do another session there! Kerri - Beautiful little girl and the image of the barn is stunning! Holly G - Awww, she is so cute! Lisa - Oh i would love that barn – and that beautiful girl – great rich processing!! Lacey - Cool barn! I’d love to see more shots of your daughter, too! She’s adorable! Christina Corneau - that is a gorgeous barn and an adorable girl!! Monica Wilkinson - Awesome shot of the barn and your daughter is always so darling!!! Christy F - What a spectacular barn shot! And your daughter is adorable!!! amy - oh wow– what an amazing location! so dramatic 🙂 she is just the cutest! Holly Thompson - I have such a love for barns. What an exquisite location! Your daughter is beautiful!!! Love her expression. Miranda - What an adorable little girl! And an amazing barn! amanda - Great photos! I wish I had barns like that where I am at! Ashley - aww she is adorable! Love the barn!! Toya - She is way too cute to hate the camera. Robin - Awesome location, I love your daughter’s sweet expression! Lena (Live Love Laugh Photos) - LOOOOVE them! C. Crowder - What a great location! Your daughter is such a cutie toot! Tonya - Sweet little girl! Love the photos! This little girl was such a pleasure to photograph. Mom and dad were so excited and I travelled to their beautiful home by buffalo lake to this this shoot. The windows were to DIE for!! Oh I miss it there. Deanna - Love these!!! I NEED to get a petti romper!!! Jenn - I love the one with the pettiromper! Beautiful! And I LOVE the header on your blog with the pea in the pod! How creative! amy - aww so sweet! i just love that second shot especially. nice work! Nicki - so precious! beautiful images. Stacey M - So precious. Love the first one with her little toes peeking out. Julie - I just love your newborn work! Andrea Gomoll - OMG how adorable – great job with those pictures! Holly Clouse - Adorable! I’ve seen that last little bloomer outfit used before, sooooo darling! Beth Johnson Photography - OMGosh, I love that last shot! These are so precious! Robin - Precious, I love the last shot! Lacey - I want to see more! 🙂 These are precious and the last one shows, I imagine, how this little sweety will grow up… ruffles, pearls and all things pretty! Krista Lund - what a little sweetheart! great job! Tonya - Beautiful photos, love them all!! Romina - great pictures! i really love the last one! she is so cute! Monica Wilkinson - Gorgeous..that last one is my favorite!! I am dying to use my little ruffle outfit like that! Amber - These are great. That last outfit is to die for. I love it! Melissa - Soooo pretty! Love the little ruffle outfit! Christy F - Rezika, these newborn portraits are simply beautiful!!!! Just lovely! Kelly H - Soooo sweet. kristin - What adorable newborns – I always struggle with these, but your’s are beautiful! Stacey H - So precious! I love, love the last one. Too cute! All of them are beautiful! Erin O - beautiful! love the pearls with the baby girl. very creative! kelly garvey - REALLy beautiful! Hilary - Pure sweetness! So gentle and pretty. Great great work! Kellie - What a pretty girl! Love her pink petti outfit! CJ Wilkes - So sweet and precious. Beautiful! I just think – what a pretty little princess – the colors are perfect! Lorie Hall - I love your newborn photography! This baby is absolutely adorable! I love the pictures! Melissa Ann - I love seeing her little toes in that first basket. Beautiful. Four different newborns all captured within a few days of each other and I couldn’t wait to share some sneak peeks! The little blonde boy belongs to this couple and I couldn’t believe all the hair he had! The little sweetie in the maroon flower belongs to the mommy who’s belly is pictured here, while the purple hat baby belongs to this wonderful couple. and I have yet to post the maternity of the other mom. It has been quite a year so far with my moms and babies. I am so booked and busy and I love it! Nothing is more wonderful that doing what you love and I cannot thank you guys enough for allowing me the opportunity to capture these precious moments. Well it is now time, I have been talking about it forever and I am going to VEGAS on Sunday!!! I decided to bring my camera and I hope to share with you the fun I had! Nance H - Such beautiful newborns! Love that lavender hat! sara - so sweet and beautiful! love the little blonde blue blanket! Amanda - How precious! Love all four of them! Lauren P. - Love that 2nd image – he looks so snuggly in that wrap! Amanda B. - All such angels! Beautifu work! Shannon Wilkinson - These are stunning. I love the last one. Just gorgeous. C. Crowder - Gorgeous…what beautiful sleepy babies. Christy F - Lovely lovely newborn portraits! I love these!!! Crystal - Wow! 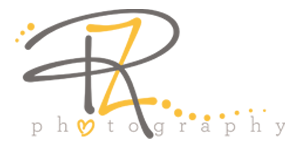 Lucky you and even luckier clients, love your work! rachael - so sweet nice job! mary - Gorgeous newborn photos! You are very talented! Beth Johnson Photography - Beautiful posing and setups! These are stunning! Kari Bruck - Simply gorgeous! The 2nd one is my favorite! Amazing work! Andrea Lythgoe - Gorgeous, all of them. I really love the blue wrap. Your newborn photography is beautiful! Tammy - Great job with so many newborns! I love them all, especially the image with that turquoise fabric. Gorg! Mary Beth - So beautiful! I love the second image, but they are all so precious. Jennifer Lauren - What an adorable little one! Toya - These are beautiful. Autumn - That second shot is to die for! Great job! Chantel - Oh these are SO precious!!!! Becca - What absolutely beautiful, precious babies. And PERFECT pictures of them! Krista Lund - these are all precious! love the headband in the 1st image. Julie - Gorgeous newborns! Beautiful work that is sure to be treasured by all the families! Hilary - What a busy time for you! You are putting smiles on so many parent’s faces. Great work! Crystal - What gorgeous babies! You’ve done a wonderful job…congrats to all of the parents! Shelley - You do amazing work, love love love. Michelle R - So adorable! NIce work! Stacey H - These are gorgeous! The second and third ones are my favorites, but all of them are beautiful. I would love to have any one of these of my little ones! © 2019 rezikazurch.com|ProPhoto5 WordPress Theme by NetRivet, Inc.